The new weapon from JPY Entertainment in the second half of the year 2012 revealed. The JB and Jr. (Junior) who are currently starring in KBS2TV Monday and Tuesday miniseries Dream High 2 and belong to JYP will debut as the idol boy band in the second half of 2012. The two persons are expected to use the group name “J&J” for their activities. JB and Jr. were tied for the first place at the 5th JYP Open Auditions in 2009 to become JYP trainees, and are rookies with solid strength. During the audition, their cute outlook and excellent dancing skill became a popular discussion. In Dream High 2, they display distinctive strength, placing themselves in the spotlight again. After 3 years preparation, they finally debuts in the second half. 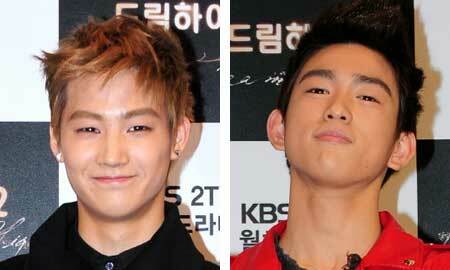 The real name of JB and Jr. is Lim Jae Bum and Park Jin Young respectively. Coincidentally, their names are the same with two of the famous senior singers. JB is formed from the initial of Jae Bum, while the stage name of Jr. who is same name with president of JYP Entertainment Park Jin Young has the meaning of Park Jin Young Junior. JB is playing the role of leader of boy band Eden (i:dn), while Jr. is playing the role of Jung Wi Bong, the dancing partner who is sacked from Eden (l:dn) in Dream High 2. They are getting attention with gorgeous dancing skill and steady acting.